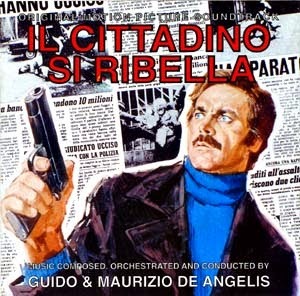 The more discerning, knowledgeable, and committed enthusiasts of the ‘Euro-crime’ cycle would probably identify High Crime as the pinnacle of Castellari’s departures into this terrain. But for its sheer energy and entertainment factor it is Street Law for me. 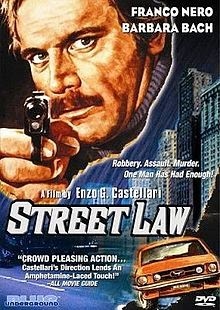 The film stars Franco Nero (who also appeared in High Crime, and would later have major roles in Keoma , The Shark Hunter , and Day of the Cobra for Castellari) as a man who takes the law into his own hands, and turns vigilante in order to bring a gang of criminals to justice. 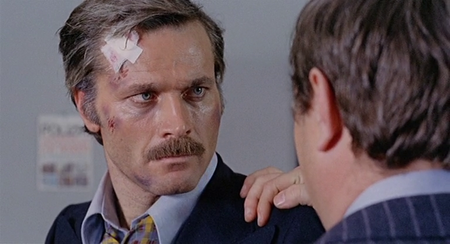 He is ably supported in the casting department by Barbara Bach, and Giancarlo Prete, and the screenplay by Arduino Maiuri based on a story by Massimo De Rita follows the template laid down by Death Wish (1974) with aplomb. But a combination of assured action orientated direction (Castellari excels in this area over Michael Winner) and a knockout score courtesy of Guido & Maurizio De Angelis, elevates the film above that which it is mimicking. The De Angelis brothers were no strangers to the gritty urban terrain of ‘Euro-crime’. 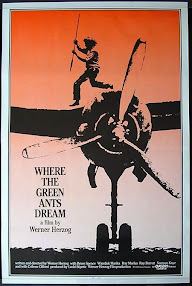 They had already provided scores for The Sicilian Connection (1972), High Crime, Violent Professionals (1973), and The Knock-Out Cop (1973) before embarking on Street Law. The soundtrack has had very limited distribution, and wasn’t released on vinyl at the time. 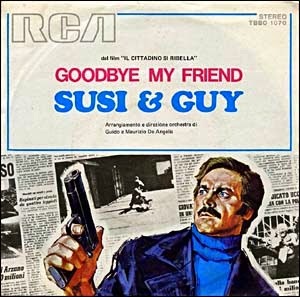 A 7” single of the vocal version of Goodbye My Friend backed with the vocal version of Drivin’ All Around by Susi and Guy was released in October 1974 in Italy on RCA Records. But fans of the soundtrack had to wait until April 2002 for a CD release courtesy of GDM CD Club. The CD comprised sixteen tracks, though there is essentially only three pieces of music on the album, as the majority of the tracks are remixed versions of Goodbye My Friend, Drivin’ All Around, and Il Citadino si Ribella (Main Titles). I always tend to avoid trying to analyse music myself, I’m not an expert in this area, and besides I do not believe vocabulary is up to the task. Why read about a piece of music when you can listen to it? I shall leave these tracks to speak for themselves...Enjoy!